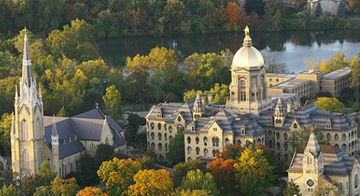 TOP VIDEO: Why does Notre Dame keep getting ranked as the top college for studying business? Notre Dame has been named by Businessweek as the #1 undergraduate college for studying business for the last five straight years. But why? In this video, you'll find out. It's a discussion between @FrancescaToday and Jonathan Rodkin at Bloomberg Businessweek, and Dr. Roger Huang, the dean of Notre Dame's Mendoza College of Business. It's a fascinating discussion, where you'll hear what makes Notre Dame such a unique place to learn about business. And Dr. Huang even gives some admissions tips, which you can use if you want to get into this legendary school.